21st Century security challenges raise questions about the effectiveness of the traditional intelligence learning paradigm suggesting the need of a complex, agile and rapidly changing intelligence analysis approach. Intelligence analysis (IA) professionals are faced with daily challenges to meet high demands for rapid, accurate assessments that require discovery and marshalling of evidence, integration and synthesis of data from disparate sources, interpreting and evaluating information that is constantly changing, and providing documentation and recommendations that meet the customer’s reporting requirements. 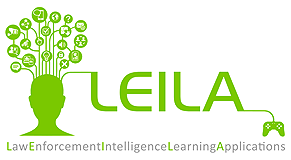 In this context, via a holistic learning methodology and a “serious games” solution, the LEILA project enables to empower intelligence analysts by improving their cognitive capabilities, reasoning skills and creative approach, at individual and group level.